WESLACO — Top officials for each of the four counties in the Rio Grande Valley came together Monday for a meeting of the minds, where they each touted ongoing regional projects. Dubbed the State of the Valley, the event was reportedly the first of its kind. The Society for Marketing Professional Services of the Rio Grande Valley hosted the meeting at Knapp Medical Conference Center, where county judges used the platform to discuss achievements and future challenges in a region that continues to experience high growth. “If we keep fighting over a slice of bread, nobody is going to get the whole loaf,” Cameron County Judge Eddie Treviño, Jr. said in his address. Treviño was joined by his counterparts in Starr and Willacy counties. Starr County Judge Eloy Vera attended the ceremony along with Willacy County Judge Aurelio Guerra. 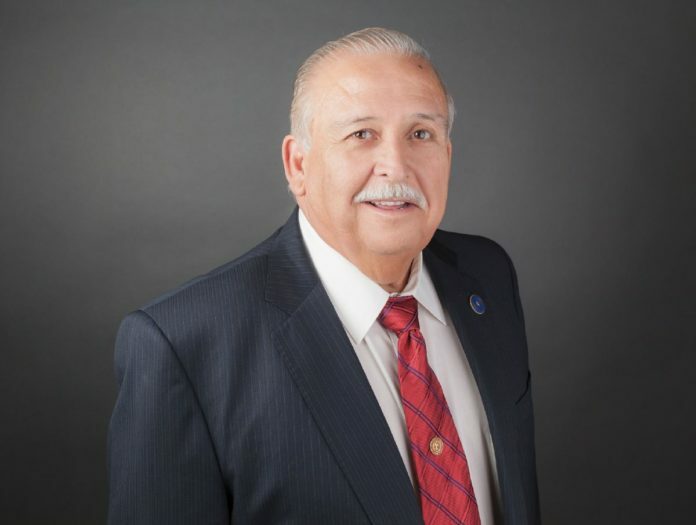 Hidalgo County Judge Ramon Garcia did not attend the function, and sent Hidalgo County Economic Development Director Bobby Villarreal in his stead. Vera touted a low crime rate, a functioning hospital district and a recent $8 million investment to fix an existing retention pond in Starr County that will help improve drainage in the area. “We don’t flood like Willacy and Cameron County, but any rain that we get runs really quick down the hills,” he said. Vera also highlighted the county’s ability to lure what he called “one of the largest wind farms in the state of Texas,” which he said equates to about a $1 billion investment. “We’ve been very fortunate to get the wind farms interested in Starr County,” he said. The county continues to pursue renewable energy in the form of two different companies. One is a wind farm, and the other specializes in both wind and solar energy, Vera added. It has also partnered with Mexico in promoting Ruta (Route) 54, a highway that stretches from Roma to Monterrey. Villarreal said Hidalgo County is in the “best financial condition” it’s ever been and touted an array of partnerships with cities and neighboring counties, such as its cooperation with Space X incentives in Cameron County, its resolution in support of an LNG pipeline and its renewed attempt to construct the Raymondville Drain, a regional drainage project in partnership with Willacy County. Hidalgo County has more partnerships now than there have ever been in his 15 years with the institution, Villarreal added. County leaders have also forged 13 different Tax Increment Reinvestment Zone (TIRZ) agreements with other cities and are trying to lure three companies that could bring in about 1,000 new jobs. “We can’t have economic development without an educated workforce,” Villarreal said. A skilled workforce will be especially important in Cameron County in the near future as it prepares to usher in the next generation of space exploration, Treviño said. “We need to make sure we’re giving people the skills that they need,” he said. Cameron County is also focusing on its crown jewel, South Padre Island. The county is hoping to become the next port of call for cruise ships and is actively upgrading its parks throughout the island. A second causeway is also in the works and could be a real economic driver for the region because it will eventually connect with Highway 281 in Hidalgo County, Treviño said. An LNG pipeline is also being considered and could pump up to $15 billion into the local economy. Neighboring Willacy County is not growing as fast as other parts in the region, but that doesn’t mean the county is not preparing for growth, Guerra said. The county, which is not part of a Metropolitan Planning Organization (MPO), is working with the Texas Department of Transportation to build overpasses along I-69. The overpasses will help ease traffic and provide farm crossings for local businesses. In addition, the county purchased 100 acres that can be used for industrial farming, Guerra added. Despite a recent windfall in revenue, the county is in good shape, Guerra added. Reserves helped Willacy invest in different industries, such as ecotourism. The county recently opened a resource center and hired a community development specialist, a position that has never been in place. We are ready to invest on ecotourism and other industries that will help Willacy County grow at a faster rate,” Guerra said. But perhaps the biggest and most-controversial regional endeavor the Valley is currently facing is the merging of the two existing MPOs between the two heavyweight counties, Hidalgo and Cameron. While everyone appeared onboard at Monday’s event, not everyone is convinced a merger would be as beneficial. Vera said Brownsville and Harlingen remain skeptical about the move, but was optimistic everyone would eventually come to the table and pointed to other parts of the state that have been able to merge. “If all those areas can get together, for crying out loud, why can’t the Valley get together,” he said.